Montana Test.com - Results for: GSI 50 OZ Java Press! Reviewed and Approved! GSI 50 OZ Java Press! The GSI Java Press is a cool gizmo for campers and hunters. It is a coffee press, with a 50 oz. carafe and insulating sleeve. It weights a mere 14. 6 oz. and brews coffee in a hurry. There is nothing better than a fresh cup in the morning. 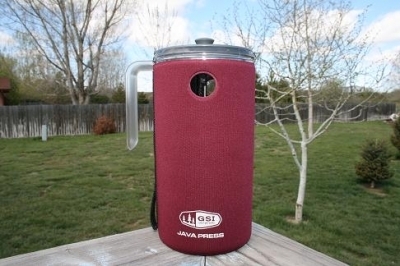 No one likes to wait for a large pot to brew, you don’t have too with the Java press. Bring your coffee blend along and brew yourself. It eliminates waiting, just boil water add coffee and plunge. It brews fresh coffee every time. Split-ring plunger design virtually eliminates coffee blow-bye™ for the most flavorful, mud-free coffee. 6.2" x 4.8" x 9.6"
Coffee does cool off after a few minutes!